When Halloween ghouls and ghosts are just around the corner, take a trip to your local farm stand and follow these tips for creating a foolproof jack-o'-lantern. The bigger the pumpkin, the easier it is to carve. Avoid any with bruises or moldy stems—they'll spoil much faster. Light-colored pumpkins tend to be softer and easier to cut into. When cutting out the lid, angle the knife at 45 degrees. This gives the lid a place to rest when you replace it so it won't fall through. Use a large metal serving spoon or an ice cream scoop to scrape the insides. If you will be lighting the pumpkin, the inside of the pumpkin should be scraped flat so the light source will be on a steady surface and won't rock. The back wall of the pumpkin should be scraped as smooth as possible since this will reflect the light. The optimal thickness of the pumpkin wall is about 1 inch. 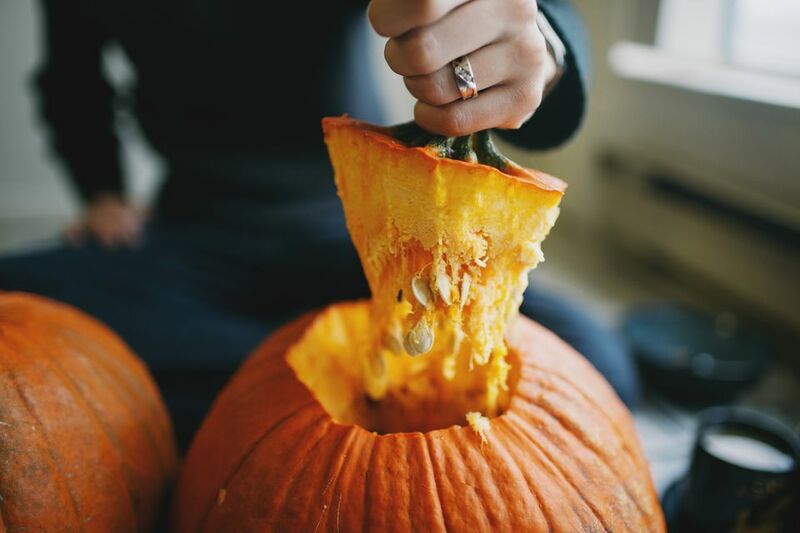 When cleaning out the pumpkin, save the seeds. Toasted pumpkin seeds make a healthy and tasty snack! Beginners should select a simple, bold pattern. Once you master the simple patterns, you can move on to something more difficult. Print out or draw the pattern on a piece of paper. Use small sharp scissors or a razor to cut out the areas you will be carving into the pumpkin. Then tape the template onto the pumpkin and use a marker to trace the carving lines. Cutting slits in the paper will help it to conform to the round surface. A long serrated knife or a pumpkin-carving knife with teeth will be necessary to cut through the thick flesh. Use a sawing motion and take your time cutting along the outside edge of the marker lines so there is no marker residue. As an alternative, you can tape the outline to the pumpkin and use a nail or pushpin to score the carving lines onto the pumpkin. Connect the dots as you carve. For longer life, soak the cleaned pumpkin a couple of hours in a solution of bleach and water: 1 teaspoon bleach to 1 gallon of water. Dry thoroughly, then rub the pumpkin inside and out with vegetable oil or petroleum jelly to prevent shriveling. Apply to the cut edges, too. If the pumpkin begins to shrivel, repeat the process. Consider cutting off the bottom of the pumpkin as well as the top. The pumpkin will be more stable and also easier to carve. If you plan on using a candle to light your jack-o'-lantern, be sure the opening in the bottom is large enough to fit over the candle. Place the candle on a fireproof base large enough to accommodate the pumpkin. You can then easily lift off the jack-o'-lantern to light the candle. Place the jack-o'-lantern in a plastic bag and refrigerate when not in use. Try making an uncarved jack-o'-lantern by painting designs with royal icing. You can enjoy a decorated jack-o'-lantern but still use the pumpkin as a fall decoration when Halloween has come and gone. Do not eat a pumpkin that has been carved as a jack-o'-lantern. If you will be lighting your jack-o'-lantern with a candle, be sure to leave the lid off to avoid a fire hazard. Use a votive candle in a glass holder or tea lights in a metal case. If you want to leave the lid on, carve a hole in the unseen back side of the pumpkin to act as a chimney. Never leave a candlelit jack-o'-lantern unattended for any length of time. A small battery-operated flameless candle is a safer choice than traditional candles for lighting your jack-o'-lantern. Sprinkle the bottom side of the pumpkin lid with ground cinnamon, nutmeg, and/or cloves to let your jack-o'-lantern do double duty as an air freshener. Where Did the Name Jack-O'-Lantern Come From? The British term jack-o'-lantern dates to the 17th century, when it literally meant "jack (a man) with a lantern," a night watchman, in other words. It was a popular nickname for the natural phenomenon of flickering blue lights sometimes seen over wetlands at night, known as ignis fatuus (fool's fire), which has long been associated in folklore with mischievous ghosts, goblins, fairies and the like. Originally, jack-o'-lanterns were carved out of turnips, not pumpkins!